He came from the 'Land Of The Midnight Sun', sparkled on the jazz-rock stage as an 'Elegant Gypsy', came up trumps in the 'Casino' with all the right chords and melodies, and his 'Splendido Hotel' was the number one address for fusion fans around the globe. He finally achieved immortality together with John McLaughlin and Paco de Lucia on 'Friday Night In San Francisco'. 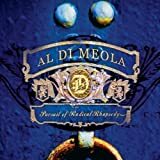 For guitar lovers, the name Al Di Meola carries the same guarantee of quality that Ferrari does for sports car enthusiasts or Chateau Mouton-Rothschild for wine connoisseurs. 'Elysium' is the climax of this process so far. The artist has arrived where he always wanted to be. He himself thinks of Elysium as a 'place of perfect happiness'. A paradise where acoustic and electric components, triumphant rock and finely entwined jazz, delicate and pumping rhythms, guitars and keyboards, wide panoramas of rock and diaphanous carpets of sound come together in harmony. In this magical Elysium, everyone complements each other. Al Di Meola has brought together a five piece band with no bass. While he plays all the guitar parts himself, both acoustic and electric, including unbelievably fast and elegant riffs and effervescent rocking chords, three keyboard players and pianists provide shades of colour. This trio includes new recruit Philippe Saisse, who also contributes the composition 'La Lluvia'. The others have shared musical accomplishments with their band leader going back decades. Barry Miles has known Al since the seventies. Mario Parmisano can be heard on recordings such as 'Orange And Blue' (1994) and 'Flesh On Flesh' (2002). Two new rhythm players have now joined the team: percussionist Rhani Krija and drummer Peter Kaszas. Both of them are wide awake and always right up with the beat. The gates to paradise for guitar aficionados are open to everyone with 'Elysium'. 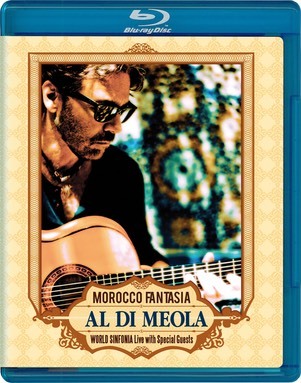 Guitar Superstar Al Di Meola pays Personal Tribute to The Beatles. "All Your Life" puts a Fresh New Rhythmic Slant on Beloved Tunes. On Di Meola’s latest outing, Pursuit of Radical Rhapsody, the guitar virtuoso and world music pioneer deals in more evocative and compelling sounds with is World Sinfonia ensemble, delivering hauntingly beautiful and deeply moving music from track to track. The collection kicks off with the entrancing, suite-like “Siberiana,” which opens with some tender call-and-response between Beccalossi’s accordian and Di Meola’s nylon string acoustic guitar before building to a turbulent section with searing electric guitar lines on top. On the affecting “Paramour’s Lullaby,” Di Meola takes a more deliberate approach on electric guitar, spinning warm, lyrical lines over the beautiful harmonies before engaging in spirited call-and-response with Beccalossi near the end of the piece. The rhythmically charged “Mawazine”(featuring percussionist Mino Cinelu) is broken up into two parts on the album and showcases some typically tasty electric guitar work by the leader. The lushly cinematic “Michelangelo’s 7th Child” (featuring Hungary’s Sturcz String Quartet) has Di Meola utilizing subtle MIDI textures and colorations on his acoustic guitar while also showcasing some virtuosic runs. “Gumbiero” is a stirring Latin number underscored by Ortiz’s churning conga work. Sparks fly between Di Meola’s signature fretboard bravado on both acoustic and electric, Beccalossi’s facile accordion playing and Gonzalo Rubalcaba’s dazzling piano work on this spirited offering. “Full Frontal Contrapuntal” features some chops-busting unisons and intricate exchanges between Al’s MIDI-tinged acoustic guitar and Beccalossi’s accordian. The surging “This Way Before” and the evocative, flamenco inspired “Fireflies” both feature Di Meola alternating between acoustic and distortion-laced electric guitar licks. The stirring Latin flavored “Destination Gonzalo” and “Radical Rhapsody” both feature virtuosic contributions from pianist Rubalcaba and former Weather Report drummer Peter Erskine. The poignant “Bona” is a tender offering with the Sturcz String Quartet that features some of Di Meola’s most lyrical playing on the record. The leader also turns in soothing interpretations of two classic pop tunes, the Beatles’ “Strawberry Fields” and “Somewhere Over the Rainbow,” both of which feature the great jazz bassist Charlie Haden.